On August 9, Samsung unveiled a raft of new Galaxy devices at the Galaxy Unpacked event in New York City. Offering the slick design and premium features expected by high end consumers, these ﬂagship devices will also appeal to business people looking to improve their productivity and organisation. 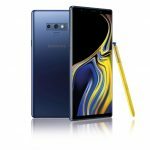 Top billing went to the Samsung Galaxy Note 9, a premium smartphone that doubles as a highly productive business device, thanks to features like a 6.4-inch Super AMOLED Infinity Display – the largest edge-to-edge display on a Note so far – an ‘all-day’ 4,000mAh battery and expandable memory up to a massive 1TB. The S Pen – the defining feature of the Note range – has been given an upgrade, with support for Bluetooth LowEnergy (BLE) connectivity. This enables it to be used as a wireless remote control, as well as an input device and digital pen for adding handwritten notes to images and messages. By clicking the S Pen, users can take selfies and group pictures, present slides, play and pause video and more. 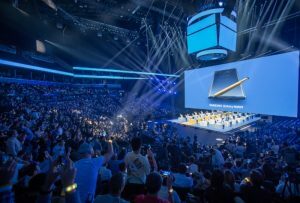 Samsung’s intelligent assistant, Bixby, offers business users additional productivity benefits, including Adobe Scan for Bixby Vision, a free app that uses the Galaxy Note 9 camera to capture documents, business cards, expenses receipts etc. for editing, annotating, saving and sharing. Bixby Vision automatically detects when a document is in the Galaxy Note 9’s field of view and suggests opening it in Adobe Scan. With built-in automatic text recognition, Adobe Scan turns captured documents into Adobe PDFs that can be edited, saved, signed and shared. Using intelligent Adobe Sensei technology, the app can automatically extract relevant details from a business card and add them to the Galaxy Note 9’s contacts. For mobile workers, built-in Samsung DeX functionality enables a Galaxy Note 9 to connect to a PC monitor (via a small HDMI cable) and display a virtualised desktop. As well as giving users the option to use apps, including Microsoft Office, with a larger screen and keyboard in a home office or touch-down area, this capability enables a Galaxy Note 9 to be used as a fully functional second screen, e.g. for making notes with an S Pen while watching a video, or as a trackpad for cursor control. For security, the Galaxy Note 9 comes with Samsung’s defence-grade Knox security platform and biometric authentication options, including fingerprint scanning, iris scanning and facial recognition capabilities. Also unveiled at Galaxy Unpacked, the new Samsung Galaxy Tab S4 with 10.5- inch Super AMOLED display combines the portability of a tablet and the functionality of a PC. When connected to the optional Book Cover Keyboard (or launched from the Quick Panel), the Galaxy Tab S4 starts up Samsung DeX, which gives users the option to switch from the device’s Android interface to a desktop experience. If more screen space is needed, users can extend Samsung DeX to an external monitor via HDMI, retaining the Galaxy Tab S4 as a fully functional Android tablet. In addition to a 10.5in display, the Galaxy Tab S4 features a 7,300mAh battery providing up to 16 hours of video playback; an enhanced S Pen for added productivity; the Samsung Knox security platform; and quad speakers and Dolby Atmos immersive sound technology for crisp, enveloping audio. Tapping into the wellbeing trend, the new Samsung Galaxy Watch features a stress management tracker that detects high levels of stress and offers breathing exercises to keep users relaxed and focused. For personal fitness, it includes 39 workouts, a calorie tracker and a sleep tracker that provides insight into the wearer’s sleep patterns. Morning and evening briefings help users keep on top of their workload. 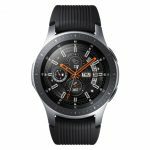 The Galaxy Watch features improved battery life of up to seven days and later this year will be available with 4G connectivity (initially through EE), enabling it to be used independently of a smartphone for calls, messaging, mapping and music. Of more interest to consumers, Samsung also revealed its first smart speaker, the Galaxy Home. Full details are yet to be announced, but what we do know is that the device has six speakers and a subwoofer; eight far-field microphones for voice input and Bixby activation; and an unusual, opinion dividing three-legged design.